A darkly witty, smartly demythifying Western by Trevanian, best known for his ever-atypical novels in various genres (The Summer of Katya, 1983, etc.). Twenty Mile, Wyoming, is a sun-bleached ghost town and narrow-gauge train stop halfway between the Surprise Lode and the boomtown of Destiny. 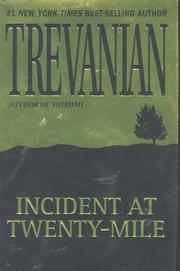 Trevanian takes the sociological measure of Twenty Mile back in 1898, when it was slipping into oblivion but still inhabited by 15 residents and a tiny handful of businesses: a livery stable, a three-stall whorehouse, the Mercantile, a tonsorial palace, a boardinghouse, and not too much more. Saturday nights find silver miners from the Surprise Lode blowing their pay on whores and whiskey, then disappearing back to the joint on the Sunday train. Into town drifts the very youthful Matthew Dubchek—a.k.a. the Ringo Kid, a.k.a. Matthew Bradford Chumms, et al.—a self-described compulsive liar given to aliases. Did he kill his parents back in Nebraska? Matthew soon manages to get himself a few odd jobs around town and sets himself up in the marshal’s abandoned office. Then crazy murderer Hamilton Lieder escapes from the state prison with two other equally crazy murderers and arrives in Twenty Mile to rob the train of its silver. Lieder is a strongly conceived patriot/villain who hopes to enlist the silver miners in his crusade against the International Conspiracy, the Yellow Peril, and the immigrants sucking out America’s lifeblood. Lieder and his men round up all the guns in town and await the train. Will Matthew, who appoints himself marshal, be able to match wits against the crazies? Will beautiful Ruth Lillian get to the mine and warn the miners of the thieves? Factually based and richly researched: one of the best Westerns since True Grit.